As a next-gen utility cart designed to move heavy loads with a riding mower, OxCart is now available for turf, lawn and landscape professionals. 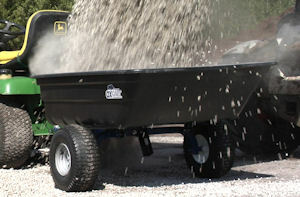 It features an exclusive power-assist lift and reduces dumping effort by up to 90 percent, the company says. Run-flat tractor-grade turf tires move heavy loads rut-free across turf and lawns. The side dump rotates 110° from either direction, making it easy to place heavy loads where they were meant to go.